"We cannot recommend Steve's books strongly enough. The information and deceptions exposed in these books is something we all need to understand and share with others." Yet, tragically, professed "Christians" all around the world recognize Steve Wohlberg as a Christian, and happily sell his damnable books. If God-hating, Bible-disobeying, Christ-rejecting Wiccan witches highly recommend Mr. Wohlberg's books, something is VERY WRONG!!! You see they are all on the same team--the Devil's team--so they work together fighting against the truth of God's Word. Steve Wohlberg is a heretic, who teaches the lies of Seventh-Day Adventism, including the ridiculous and unbiblical theory of the Investigative Judgment (a far fetched doctrine fabricated by Ellen G. White). Occultist Ellen G. White, and others, officially founded SDA in 1963, which was spawned as a result of a failed prophecy by a heretic named William Miller. Miller predicted the Lord's return, and had set a date for October 22, 1844. Followers of Miller sold their homes, quit their jobs, and gave away all worldly possessions. There were an estimated 10,000 followers of Miller, known as "Millerites." When Miller's prediction failed to come to fruition, people became suicidal. To save face, a handful of Millerites scrambled to fabricate a cover for their blunder; thus, SDA was born. This is the hilarious and yet tragic history upon which the SDA Church was founded. This alone should cause every SDA to leave their organization, and follow the Word of God instead! Jesus NEVER started a religion; BUT, rather, commanded us to... SEARCH THE SCRIPTURES (John 5:39). Just as with the damnable Catholic religion, SDAs have fabricated their own TRADITIONS which are completely unbiblical, and go 100% contrary to the plainest teachings of the Bible. It is tragic that the pastor's of America's largest Independent Baptist Churches are more interested in writing books on finances, than on prophecy and the Endtimes. The world is absolutely enamored with the subject of the end times; yet the church is fast asleep. As a result, cult leaders and shysters are propagating lies that receive raving reviews from witches and other God-haters. Great men of God from the past, who have written Biblically sound books on prophecy, are being silenced by greedy ministries today, who hold the copyrights to the books, and couldn't care less about anything other than making more money. The world is going to Hell folks! We need reinforcements on the frontline! Steve Wohlberg is delusional, and a false prophet. Seventh-day Adventism is a strange religion, that veers considerably from the plain teachings of the Scriptures. SDAs believe in soul sleep, as do the Jehovah's Witnesses. Soul Sleep is the false doctrine that a person is unconscious after death, and remains in such a state until a future resurrection. In sharp contrast, 2nd Corinthians 5:8 states... "We are confident, I say, and willing rather to be absent from the body, and to be present with the Lord." Jesus told the thief on the cross... "Today shalt thou be with me in paradise" (Luke 23:43). In Luke 16, Lazarus died and was carried by angels into Paradise (i.e., Abraham's Bosom). Such Biblical references are clear evidence against the false doctrine of Soul Sleep. There is no break in conscience at death, for the spirit cannot die physically. Steve Wohlberg is a dangerous man, because he APPEARS to be a Christian; BUT, he is a wolf in sheep's clothing (Mathew 7:15). Mr. Wohlberg's books and teachings are in popular demand--a clear indicator of the apostasy of these last days. For a man to deny so many fundamental teachings of the Scriptures, and still retain such a large following, is disturbing indeed. Please do NOT be deceived--Steve Wohlberg is a Seventh-Day Adventist minister, who adheres to the damnable doctrine of the Investigative Judgment. He is NO Christian. Contrary to Walter Martin's claim, in his book The Kingdom of the Cults, SDA is NOT a Christian cult! SDAs clearly adhere to a works-based salvation, which requires it's members to endure 'til the end to be saved. This is a lie of the Devil, as evidenced by Scriptures such as 1st Corinthians 3:15 and 5:5 which show that some believers live in horrible sin; YET, still go to Heaven. Adventists Teach Salvation by Works! "In article 9 (of 'What Seventh-Day Adventists Believe'), it says, 'that those who are truly converted and love God will diligently study, and give heed to, His Word.' And they give eight Scripture references and none of them say anything like that. The simple truth is that people who are converted do not always 'diligently study' the Bible and do not always obey it in many matters. This is a part of the doctrine of salvation by works which they teach, and that one may keep saved by keeping on working." 'Those who accept the Saviour, however sincere their conversion, should never be taught to say or to feel that they are saved. This is misleading. Every one should be taught to cherish hope and faith; but even when we give ourselves to Christ and know that He accepts us, we are not beyond the reach of temptation ... Only he who endures the trial will receive the crown of life." 'Thus we escape on the one hand, the false doctrine of Universalism; and on the other, the equally false doctrine of claiming full and final salvation for a man before he has endured 'unto the end.' "
Clearly, SDAs teach that a person must "endure" to the end to be guaranteed salvation in Christ. In contrast 1st John 5:13 states, "These things have I written unto you that believe on the name of the Son of God; that ye may KNOW that ye have eternal life, and that ye may believe on the name of the Son of God." We read in Romans 4:3, 5 that Abraham simply BELIEVED God, and was saved WITHOUT any works, "For what saith the scripture? Abraham believed God, and it was counted unto him for righteousness ... But to him that worketh not, but believeth on him that justifieth the ungodly, his faith is counted for righteousness." There is NO mention of enduring to the end to be saved. "Enduring" would be a work. Eternal life is a "FREE GIFT" (Romans 5:15; 6:23), paid for by the precious blood of Christ (1st Peter 1:18,19). SDAs teach salvation by works when they require a person to "endure unto the end" to be saved for certain. "Here is our position: Only those will be saved who, having been redeemed by the grace of Christ, walk in obedience to all the light that God sheds on their way." This is the official Adventist position! The above doctrine means that all SDA members must comply with ALL of the requirements of the SDA church to be saved. So, according to SDA doctrine, if you don't tithe, you're not saved.. if you don't keep the Sabbath Day, you're not saved, etc. Jesus NEVER asked anyone to FOLLOW Him to be saved; BUT, rather, only to BELIEVE on Him (John 3:16). Jesus never asked anyone to work for salvation, only believe (Acts 16:31). Steve Wohlberg is delusional, having denied dozens of Biblical truths. Mr. Wohlberg even denies that the Sabbath Day was specifically ordained by God as a Jewish ceremonial law. SDA are also Sabbath Keepers, another false doctrine. 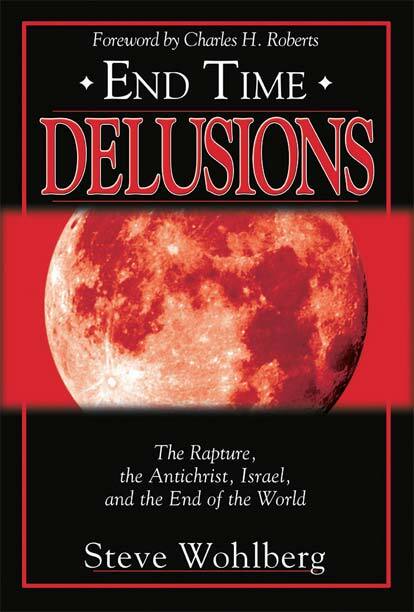 Steve Wohlberg denies the literalness of the Bible--he denies the Pretribulation Rapture, the Tribulation Period, the restoration of Israel, the coming Person of Antichrist, et cetera.